Like so many "town hall" meetings, yet another of these came together in America's heartland at Champaign, IL. Gang violence struck in a supposedly safe area. In this particular case, shots fired after a high school basketball game left three people wounded. Of course, sponsors of the event felt they needed to hear from gun control groups – because gun control did so well stopping the initial near-tragedy in the first place. 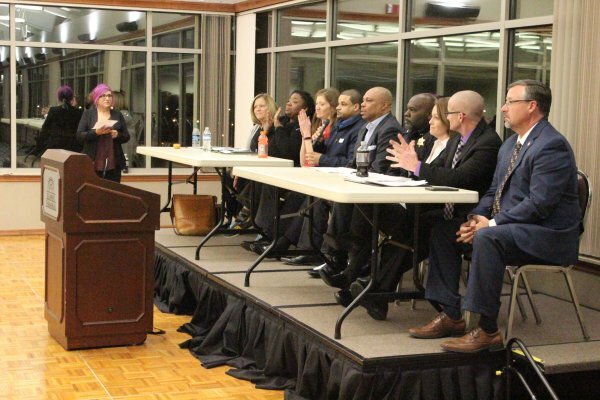 While organizers promoted the event as a town hall format, the panel of nine members only answered a few pre-selected questions and one or two others from the audience. And that meant after the Illinois leader of Moms Demand Action repeatedly citing false claims bordering on defamatory, her falsehoods stood unchallenged and unrebutted. 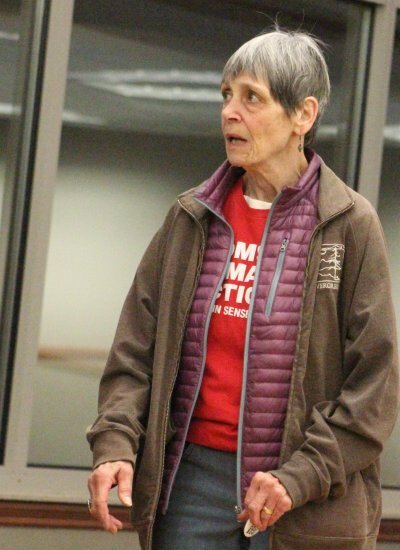 CHAMPAIGN — Six weeks after shots were fired as a of the basketball game was letting out at Central High School, nine panelists assembled at a town hall meeting agreed: Gun violence is a symptom of broader issues. 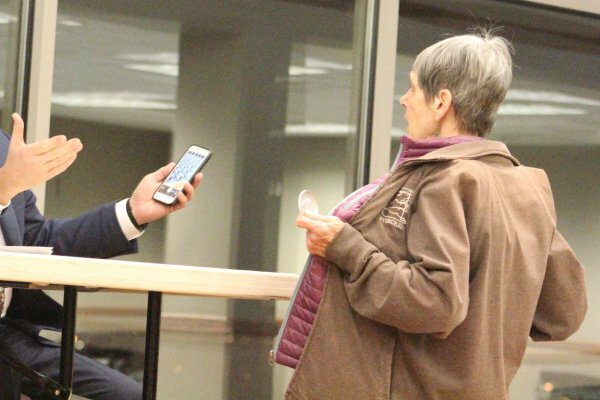 Sherri Williamson, president of Unit 4's PTA council, said she felt compelled to organize Wednesday night's event after watching how people reacted to the incident on social media. "The problem is that we disengage and blame local leaders," Williamson said. "We want to educate the public on how you can get involved and how you can support the leaders up here." 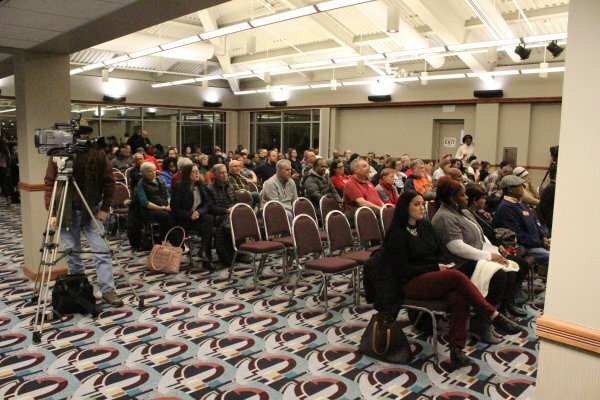 While PTA head Sherri Williamson billed it as a town hall, but attendees by and large didn't even get their questions answered, much less an opportunity to address the speakers. Ahead of the meeting, audience members approached members of the panel. Some interactions went better than others. This Moms Demand Action woman had a very interesting welcome to Champaign County Chief Deputy Allen Jones. But alas, she only flashed her t-shirt. Thank heavens. Soon after, the meeting came to order following some sound system issues. Not only did the meeting not start off with the Pledge of Allegiance, but there was no flag. 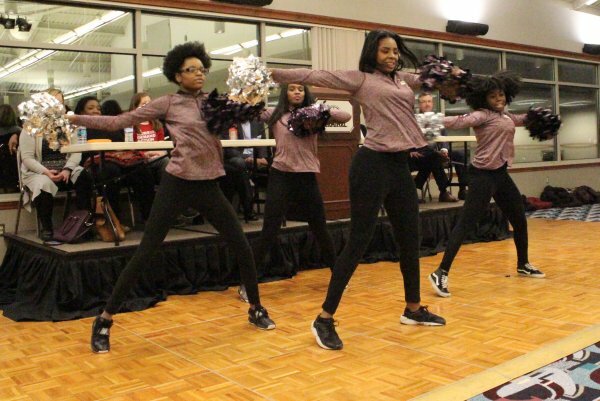 Instead, some high school dancers shared a short performance to Black Eyed Peas "Let's Get It Started". After Sherri Williamson asked the first question, the entire panel just sat there. Nobody answered. It looked and felt awkward, but nobody wanted to tackle "why" this violence was happening. One or two probably wanted to, but they probably didn't want to melt the large number of snowflakes in the audience. 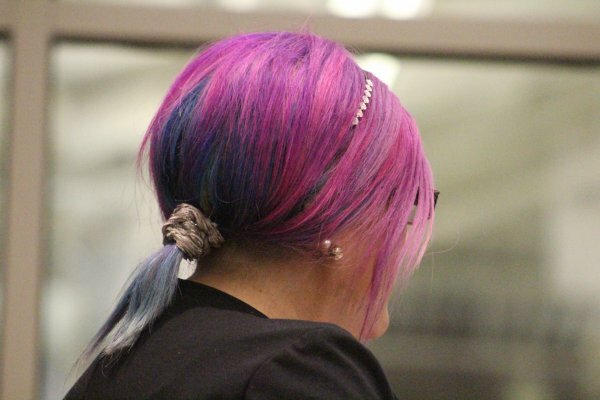 The purple-haired woman on the left is Sherri Williamson, the president of the local PTA. The whole time during the event as she spoke – and she spoke a lot – I kept thinking of the old song, Harper Valley PTA. 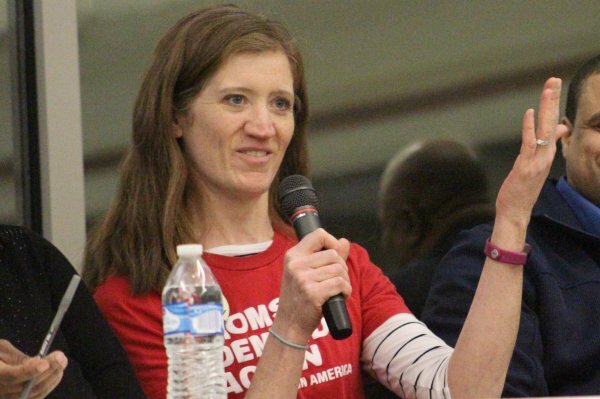 While Ms. Sherri invited not one, but two gun control activists, the invitation to the gun rights community must have gotten lost in the mail. 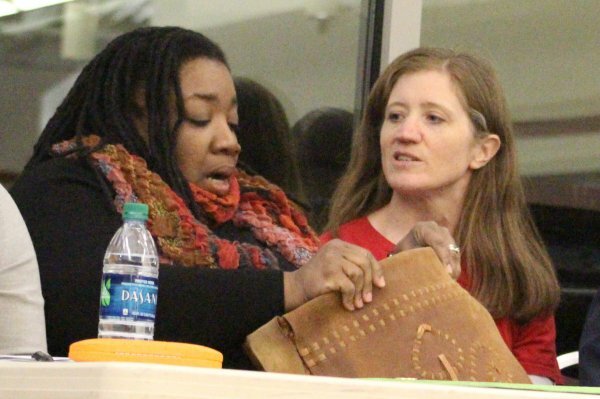 From left, Nicole Anderson-Cobb and Lauren Quinn came to promote gun control. A few years ago, Anderson-Cobb worked for the Illinois Council Against Handgun Violence as their "outreach coordinator". Either she sucked at outreaching or ICHV ran out of money to keep her on the payroll. Either way, her tenure with ICHV did not last long. One of Anderson-Cobb's claims to fame was trying to bring grassroots anti-gun activism to Champaign, IL. 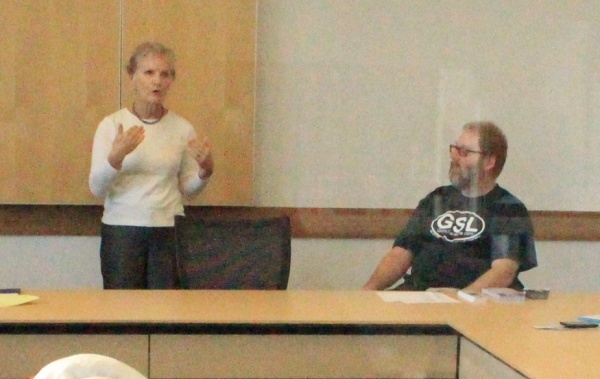 Amazingly, they tried to launch a monthly grassroots meeting in Guns Save Life's backyard. It didn't go well for them. Note the Guns Save Life member sitting directly next to the woman speaking. 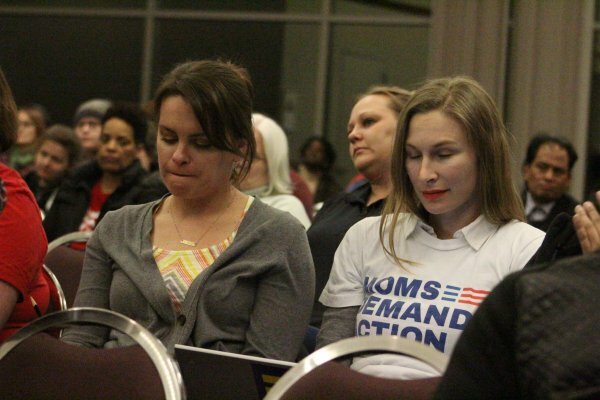 Included in the audience were Anderson-Cobb and Mary Kay Mace (second from right), the mom of one of the Northern Illinois University students killed when a lunatic opened fire in an auditorium full of unarmed targets. We made sure their first couple of meetings were well-attended, including the first one where library security and staff tried to throw me out of the library for taking photos from outside of the room. 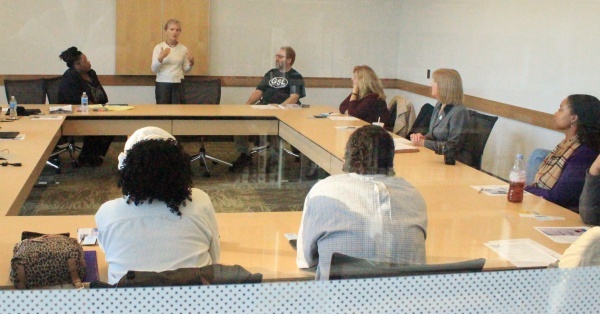 ICHV chose to hold their meetings in a room at the local public library that only seated about 20. My lovely bride noted how they had some pretty low expectations if they thought twenty seats would serve their needs. The other member of Wednesday's panel: Lauren Quinn. She has risen in the ranks of Moms Demand Action to become the Illinois Director. Quinn made a number of rather dubious claims from her seat on the panel. She claimed Moms Demand Action has 4 million members. Maybe they count Facebook likes as members. Of course, she flat out lied when she claimed that domestic abusers and criminals could drive across state lines to buy all the guns they wanted. Or that anyone could buy guns at gun shows, no questions asked. Ditto for online purchases. If gun control was truly a noble cause, why do its proponents feel the need to lie? Ms. Quinn also claimed that a few dealers in Chicagoland – the "bad apples" as she described them, sell loads and loads of guns to straw purchasers. Yes, Ms. Quinn was big on claims and short on evidence. Unfortunately, the Suzy Soccermoms in the audience didn't know any better. And, of course, the audience didn't have any opportunity to set the record straight. Perhaps that served as a feature, not a bug. A couple of points became obvious as the night wore on. And on. This high school social justice teacher wearing her Moms Demand Action t-shirt sort of dozed off. We didn't have social justice teachers when I went to high school. 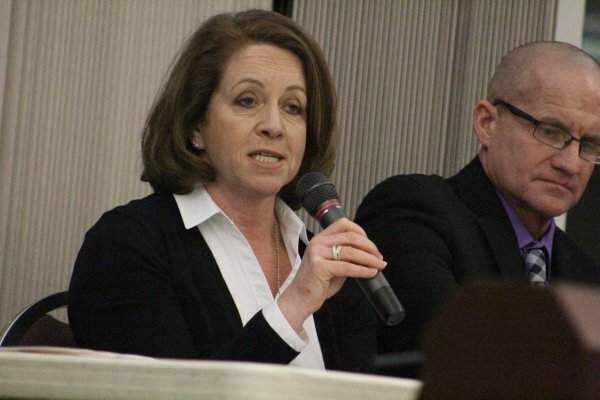 First, that Sherri Williamson and several of the panelists loved to say "gun violence" as part of the usual platitudes. They talked about so-called gun violence like it was a contagious disease of some sort. Not one of the panelists said "gang violence". In fact, it almost seemed as though panelists avoided using the word 'gang' altogether. The second glaring point I noticed: Not one of the panelists wanted to send young men to prison. Worse, the local State's Attorney, Julia Reitz, bragged how "diversion from prison is to be celebrated". Absolutely, alternatives to incarceration should be available for non-violent offenders – like a kid who takes a gun to school to protect himself from gang members. However, for those who pull the trigger… lock them up. When you lock up violent criminals, you prevent them from victimizing other innocents. Crime in America dipped almost 50% after America abandoned "soft on crime" attitudes of the 1970s. Of course, many soft-on-crime politicans like Reitz have once more taken a love to "diversion" programs. And that's how we get Robbie Patton, a local crime celebrity of sorts. In 2015, he had an altercation at a Champaign Steak 'n Shake restaurant commonly frequented by my friends and me. While none of us were enjoying a milkshake or steakburger at 5:30pm, Robbie was. Robbie found himself in an altercation inside the restaurant. He felt one of his friends had been "disrespected", so little Robbie went outside. He waited for the other group to emerge, pulled out of gun and tried to kill those other people. He missed, and fled the scene with an Illinois State Trooper in hot pursuit. After a short, high-speed chase in a stolen car, Robbie crashed and escaped on foot. Cops caught up with him. Local prosecutor Julia Reitz then went soft on little Robbie. She let him go to "boot camp", even though that sentencing option is not supposed to be available for violent offenders. And squeezing off a bunch of shots at other people, trying to kill them, pretty much fits the bill as a violent crime. After serving 8 months on an 8-year sentence, Robbie returned to the streets of Champaign-Urbana. In less than two days, cops arrested him again for drugs and who knows what else. Not even three weeks after that, he's illegally got a gun. When someone "disrespects" another one of Robbie's friends, guess what he does? He pulls out the gun and fires shots at those he believes responsible. He misses his intended targets, but in the busy University of Illinois campustown district, his errant, not-so-late-night rounds found four innocent people within a block or two. George Korchev, the recent nursing school graduate due to start his career as a registered nurse at a hospital in Libertyville, IL, the following Monday morning, was struck and killed a block away from one of Robbie's bullets. Julia Reitz, pictured above, didn't throw the book at a young punk who tried to commit murder. She instead "celebrated" with a diversion sentence and because of it, George Korchev died. But Democrat State's Attorney Julia Reitz cut a deal to let Robbie Patton, a sociopathic predator who will never contribute anything but sewage and sadness to our society, avoid serving hard time for attempted murder. It's true. Bad guys in prison don't victimize the innocent. Florida had proven success with 10-20-Life sentencing enhancements for the use of a firearm while committing a violent crime. A court struck down the law in 2016. Under the law, Florida's firearm violent crime rate plummeted to the lowest levels in the Sunshine State's recorded history. Until and unless residents demand local judges and prosecutors put violent predators in prison, gang violence will continue. Nibbling around the edges won't bring crime down. Dangling gun control out to people who don't know better will not solve violent crime, either. And not only will gun control not solve the gang violence problem, but it will make more innocent victims as criminals don't fear unarmed victims. This entry was posted on January 20, 2018 at 7:26 am and is filed under Blog. You can follow any responses to this entry through the RSS 2.0 feed. Great article John, I wanted to get to that town hall circuis but the cold and not feeling well stopped me, was wondering if anyone from GSL were able to go, thanks to you for showing up to represent and report to us. Sounds like it was not productive in the sense that the shooters outside of the high school are still free in society to continue their menacing of the "sheeple". When the "black community" will start coming forward with the identities of the criminals in their midst and cooperating with law enforcement perhaps then incidents like the shootings outside of schools will decrease. We can only hope. re: the library meetings – seems that in addition to gun control, they favor free thinking and expression control as well. The Democrats want to reverse the gains that Trump has made and are attacking on issue's they think will energize their base like gun control. If you want to keep on a path of Liberty we MUST vote to protect our causes like the 2A. Please remember the democrats understand Power, they know they must win an election first before they can wield power. Winning means you hold the seats of power. If we ever want to repeal the FOID card or restore lost rights. We must WIN first. Reitz has that typical liberal look. I think you all know what I mean. Reitz is promoting lawlessnes in her quest to make Champaign-Urbana a sanctuary community and as a result it will draw more gang members, fugitives from justice and other undesireable elements from the Chicago area into Champaign county…..crime will only get worse….just south of Champaign in the town of Mattoon the cops arrested 3 dindo nuffins from Chicago for spending counterfeit money at a Walgreens….they were caught as they were leaving the Pharmacy. You’re spot on. Also don’t forget the so called ‘judge’ that just quashed 1000’s of criminal ordinance violations giving the green light to more crime in the very near future. Reitz is a Democrat that doesnt care about the Dreams of you or your family. She and her fellow Democrats are more concerned about illegal immigrants. They are playing the game of demographic politics, the democrats want to reverse all of the gains made by Trump and Gun owners. California is now going to allow ALL illegal immigrants to register to vote. That means they can move to others states and then claim a right to vote. If you want your Dreams and rights to matter then we need to encourage others to register and vote. Going to gun shops and gun shows and encouraging people to vote is a must this mid term election.